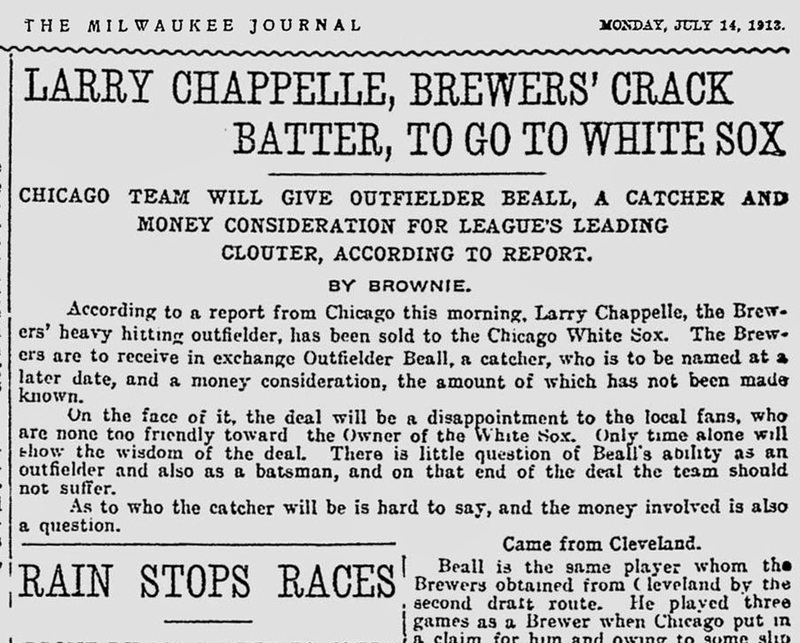 One hundred years ago today, the Brewers sold their star slugger, Larry Chappelle, to the Chicago White Sox. 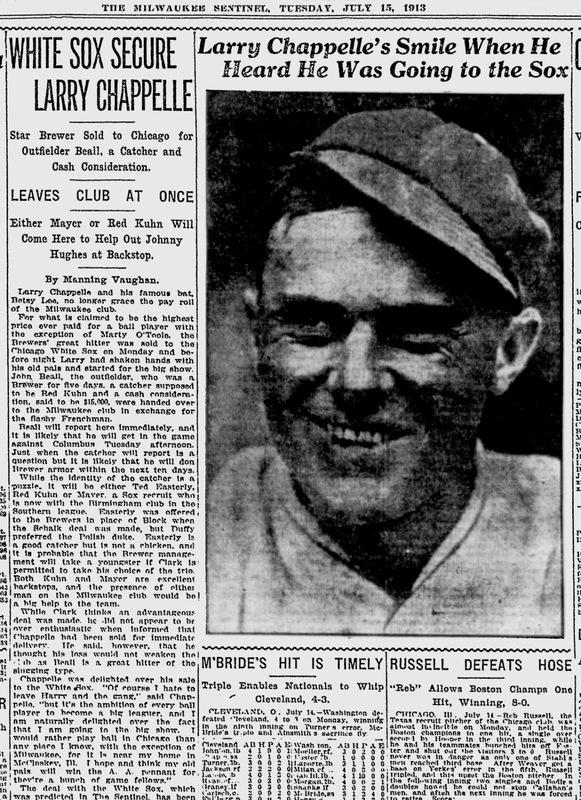 Chapelle, the center fielder, had been batting .349 for the Brews. In exchange for the slugger, the Brewers got outfielder John Beall, a catcher, and $15,000 in cash. 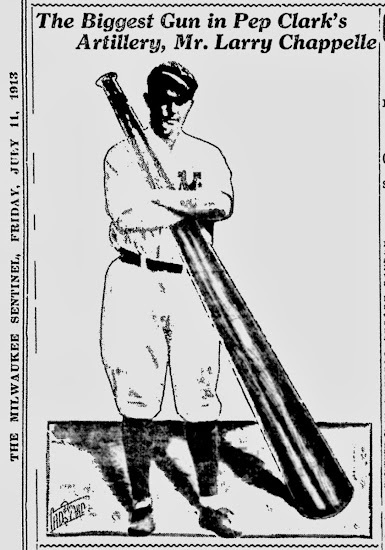 Beall had been a Brewer earlier in the season, when the Cleveland Indians sold him to the Brewers before he had finished clearing waivers. The White Sox stepped in and claimed him after he had played a mere three games in a Brewer uniform. 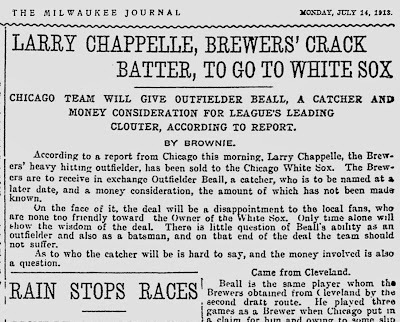 That left a bad taste in the mouth of many Brewer fans, and as sad as they were to see Chappelle go, sending him to Chicago's south side made it worse. Chappelle, of course, was understandably thrilled to get his shot in the bigs. Just three days earlier, readers of the Milwaukee Journal had been treated to this photo collage from cartoonist Cad Brand. Now that big gun would have a crack at major league pitches, and the Brewers had an important piece of their roster returned to them. Would a Beall-for-Chappelle trade help the Brewers to the pennant? In July of 1913, nobody could say for sure.